Soup, sushi, French fries, sandwiches, burritos, burgers, ice cream - these are just a few of the foods whose flavor can be enhanced with the addition of Sriracha! 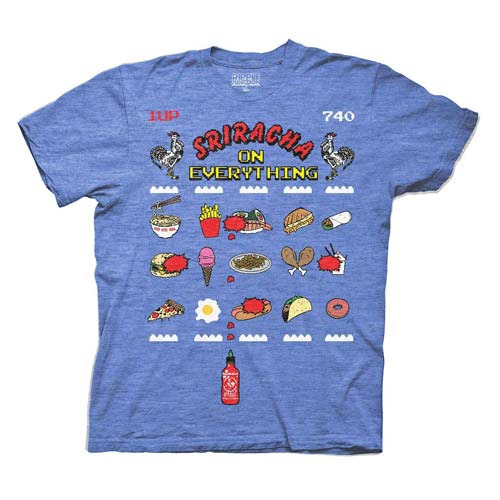 This Sriracha On Everything 8-Bit Blue T-Shirt features a cool 8-bit image of some of your favorite foods, with a bottle of Sriracha hot sauce splattering them all with its delicious spicy goodness. Complete with the Sriracha logo and roosters, this great tee is a must-have for the Sriracha lover in your life!